Description: this dinosaur stands in a very active pose, with its legs in a walking mode, left arm outstretched and right arm held back, its head raised upwards and its mouth opened, and the end of its tail bent to the left. The animal takes an attack posture and looks ready to jump on unsuspecting prey with an agitated look. It has seemingly every right to be in that state of mind since its body shows numerous signs of near misses with larger carnivores: it has scratches and scars all over its body, some small and hardly noticeable, others large and plain in sight. The largest scars look like claw marks and can be found on its back, its tail and its upper legs. Another noteworthy sign of abuse is the end of the tail, which isn’t just bent, but looks more like the bone has been broken and caused a deformity. Additionally, this figure has rather large feet to keep it from falling over (though it often does so regardless). Its sickle like claws are a bit small and the toe they’re on is stuck too much towards the back of the foot. This Velociraptor has a very simple attack action. When the tail is moved from side to side, the head swings along (as well as the other way around) as if the animal is making thrashing movements. The figure comes with a single long piece of capture gear, coloured silvery metallic grey, which can be attached to the right leg on one side and applied around the jaws on the other. Swinging the tail back and forth should cause the creature trashing off its capture gear, though it’s harder to accomplish than one might think at first. This particular Raptor repaint sports a rather simple paint job. It's largely grey, except for the top parts of the figure (upper parts of the head and tail, neck and back), which are coloured dark green instead, with triangular shapes extending from this colouration. The side edges of the upper legs are also painted green in a circular fashion with the same shapes on it, extending inwards. The creature has beige eyes with cat like black pupils, a red tongue and white teeth, as well as a black JP logo on its right upper leg. Analysis: this Raptor repaint is cursed with one lousy paint job. It wasn't the greatest Raptor sculpt to begin with, considering its overly active pose which diminishes playability, its rather boring (though original) attack option and an ineffective creature-breaks-free-of-restraints feature. All of these downsides remain, and this time the boring paint job only makes it worse. Green and grey just don't mix well and this figure proves it. Also, there's little originality in it, just one colour on top of the other and not bothering with any details. Plus the fact this paint scheme is largely copying that of the previous Cyclops Raptor sculpt, except that one had less awful colouring and more attention on details. Considering the awful scarring on this sculpt, you'd think some toy designer would do something with that, but apparently it wasn't until JPD2 someone finally noticed the paint scheme opportunity this “dino damage” offered. The lack of detail here is also shocking. A creature that has its mouth opened so wide should at least have the inside of its mouth painted with greater care. Also, the claws are totally ignored, which makes the huge feet feel even more wrong than they already are. To sum up, this figure is just a big failure and a missed opportunity on Hasbro's part to actually improve an existing sculpt by elaborating on its skin features by applying the right paint job. Repaint: yes. This is a repaint of the TLWS1 Cyclops Velociraptor, with the same capture gear as that figure had. 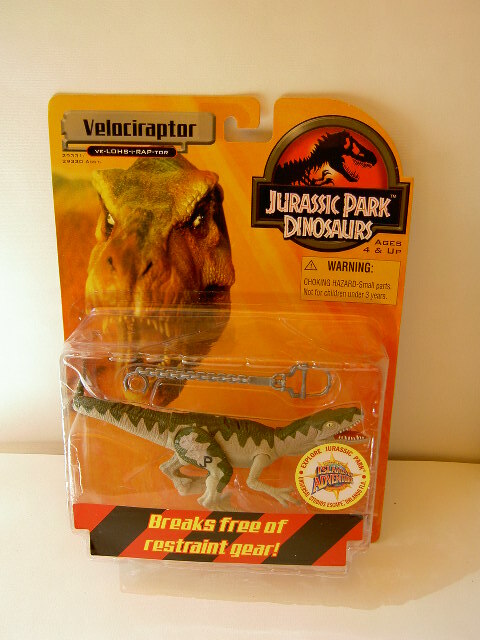 The figure would be repainted again for JPD2 and for the JP III Exclusive Dinosaur Tracking Set. Overall rating: 3/10. It never was the best Raptor sculpt around and its new paint job is very dull, severely lacking detail and originality and easily the worst of this toy line. This is one of the more common JPD1 figures and it can still be found more easily than most of the other figures from the same line, usually for fairly low prices, which shouldn't come as a total surprise.